The United Arab Emirates has long served as a hub for international trade. It has the Persian Gulf’s largest seaport and airport and is the largest export market for the United States in the Middle East. However, ongoing efforts to increase trade through the establishment and expansion of free trade zones bring with them vulnerability: the UAE has been exploited as a transshipment point for sensitive trade to countries of concern for proliferation, like Iran, Syria, and Pakistan. The UAE has sought to combat illicit trade, particularly since 2007, when it enacted a strategic trade control law that covers exports and re-exports of strategic goods. Alongside this and other regulatory reforms, the UAE has endorsed the Proliferation Security Initiative (PSI) and supports the U.S. Customs and Border Protection’s Container Security Initiative (CSI). It also has increased its interdiction of suspicious cargo since 2007. The following chronology charts re-transfers or transshipments of sensitive items through the UAE, along with its efforts to curb such illicit trade. 1971: The UAE is formed by Abu Dhabi, Ajman, Dubai, Fujairah, Sharjah, and Umm al Quwain. Ras Al Khaimah joins the UAE in 1972. 1972: The UAE signs the Biological Weapons Convention. 1972: Port Zayed opens in Abu Dhabi. Port Rashid opens in Dubai. 1976: The UAE’s first container terminal opens in Port Khalid, Sharjah. 1977: Saqr Port opens in Ras Al Khaimah. 1979: Jebel Ali Port, allegedly the largest man-made harbor in the world at the time, opens in Dubai. 1982: Alfred Hempel of West Germany sends seventy tons of heavy water from China to Dubai, from where sixty tons are forwarded to India and ten tons to Argentina. At this time India is pursuing and Argentina is interested in atomic weapons. 1983: Hempel delivers to India, via the UAE, fifteen tons of heavy water from Norway and 6.7 tons from the Soviet Union. 1983: Hank Slebos, of the Netherlands, reportedly tries to export a high-speed oscilloscope without a license to the UAE’s Assaf Electrical Establishment. The ultimate destination is believed to be Pakistan, and in 1985 Slebos is reportedly jailed for one year for exporting strategically sensitive material. 1985: Jebel Ali Free Zone is established in Dubai. Companies are exempt from all domestic capital and ownership requirements, import and export duties, and personal and corporate taxes. 1985: According to documents from Germany’s customs investigation unit, employees of Leybold-Heraeus manufacture uranium enrichment components that are sent to Dubai via Switzerland and France. French investigators reportedly allege the final recipient is Pakistan. July – August 1985: Alfred Hempel sends to India, through the UAE, 6.8 tons of Soviet heavy water that could have been used to start the uninspected Dhruva reactor. 1987: Fujairah International Airport opens. 1987: Fujairah Free Zone is established adjacent to Fujairah Port and near to Fujairah International Airport. Companies in the zone are exempt from all domestic ownership requirements and import duties on goods for re-export. 1987: Iranian officials reportedly meet associates of Abdul Qadeer (A.Q.) Khan, a Pakistani citizen, in Dubai. Iran is reportedly offered a phased supply of centrifuge drawings, as many as 2,000 centrifuges and auxiliary items, including casting equipment for manufacturing a bomb core. 1988: Ajman Free Zone is established. Companies in the zone are exempt from all domestic capital and ownership requirements, income and corporate taxes, and import and export duties. 1988: Ahmed Bin Rashed Free Zone is established in Umm Al Quwain. Companies in the zone are exempt from corporate taxes as well as import and export duties. March 1989: A firm owned by the Indian government reportedly ships sixty tons of thionyl chloride, which can be used to manufacture mustard gas and nerve agents, to Iran, via Dubai. May – June 1989: One hundred metric tons of centrifuge-grade maraging steel are reportedly delivered from Belgium through Dubai to Iraq. June 1989: Rheineisen Chemical Products arranges for 257 tons of thionyl chloride, a mustard gas and nerve agent precursor, to be shipped from India to Dubai’s Shatif Trading Company for transshipment to Iran. Rheineisen, a West German firm owned by an Iranian family, cancels the contract amid concerns about its legitimacy, and the chemical is returned from Dubai to India. Seyed Kharim Ali Sobhani, an Iranian diplomat who had brokered three shipments of thiodiglycol (a precursor of mustard gas) from the U.S to Iran between 1987 and 1988, is reportedly implicated in the deal. 1990: A Greek intermediary claiming to represent A.Q. Khan offers Iraq an atomic bomb design, promising that any required materials could be procured from Western countries and shipped via Dubai. 1991 – 1994: According to a U.S. indictment, seven persons conspire to export, without the required license, $500,000 of sensitive U.S. electronics to Iran. Controlled goods, including encryption devices, are allegedly shipped via Hanofeel General Trading Est. of Dubai to Iran’s Tak Neda Co. Ltd. Elham Abrishami, of Afshein, Inc. in the U.S., pleads guilty in 1997. 1991: The management of Port Rashid and Jebel Ali Port is combined under Dubai Ports Authority. 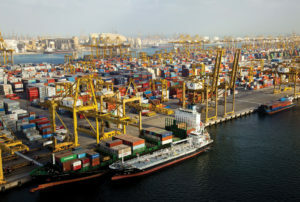 Dubai Ports Authority is the sixteenth busiest container harbor in the world, with a capacity of over one million TEU (Twenty-foot Equivalent Units). 1993: The UAE signs the Chemical Weapons Convention. 1993: A third berth is commissioned for Sharjah’s Khorfakkan Container Terminal. 1994 – 1995: Bukary Syed Abu (B.S.A.) Tahir, a Sri Lankan based in Dubai, allegedly organizes the transshipment of two containers of centrifuge components through Dubai to Iran, on behalf of A.Q. Khan, for $3 million. 1995: Sharjah Airport International Free Zone (SAIF-Zone) is established. Companies in the zone are exempt from all domestic ownership and capital requirements, import and export duties, and personal and corporate taxes. September 1995: The UAE signs the Nuclear Nonproliferation Treaty. November 1995: Hamriyah Free Zone is established in Sharjah. Companies in the zone are exempt from all domestic ownership and capital requirements, import and export duties, and personal and corporate taxes. 1996: Ajman Free Zone is granted autonomous status by the ruler of Ajman. 1996: Dubai Airport Free Zone is established near the Dubai Cargo Village. Companies in the zone are exempt from all domestic capital and ownership requirements, import and export duties, and personal and corporate taxes. 1996: The German government warns its exporters that Iranian companies active in procurement for weapons programs are present in Dubai. Among the entities named are Iran’s State Purchasing Organization and Bonyad Mostazafan and Janbazan Foundation. June 1996: Dubai’s Guide Oil Equipment Company is identified in a U.S. court as a corporation that ships impregnated alumina, which can be used in the manufacture of nerve gas, through Dubai or the United Kingdom to Iran. In 1998, Abdol Hamid Rashidian and Henry Joseph Trojack are convicted for conspiring to ship impregnated alumina to Iran. 1997 – 1998: Pars Company Inc. of the U.S. illegally exports two STX gas monitors via the UAE to Iran and is fined $10,000. The monitors can be used in chemical and biological weapons production. The U.S. Department of Commerce subsequently imposes a nine year denial of export privileges in 2002. The U.S. firm Industrial Scientific Corporation is also implicated and pays a $30,000 fine. 1998: According to the U.S. Department of Commerce, Jabal Damavand General Trading Company of Dubai transfers U.S.-origin ferrography laboratory equipment to Iran without authorization. In 2002, the U.S. bans Jabal Damavand for ten years from engaging in any activity subject to the Export Administration Regulations. March 1998: According to later reporting by the U.S. government’s Iraq Survey Group (I.S.G. ), the Iraqi Intelligence Service is using bribes to circumvent customs inspections in Dubai, which is a transshipment point for military equipment being sought from Romania. May 1998: A new Sun Ultra Enterprise 1 Work Station is located in Iraq’s National Computer Center, which was involved in Iraq’s nuclear weapons program. Iraq claims to have imported workstations from the UAE and Jordan. September 1998 – February 2001: NEC Engineers of India allegedly sends ten shipments of materials used in the manufacture of rocket propellant and missiles to Dubai and Jordan without the required export license. Indian court documents state that the consignments, shipped for $791,343, “appear to have been diverted to Iraq for assisting their weapon building programme,” violating the U.N. embargo. The Dubai companies Target General Land Transport and Indjo Trading are reportedly involved. November 1998 – February 2000: Mohammad Farahbakhsh, co-owner and managing director of Dubai’s Diamond Technology LLC, allegedly tries to export U.S. computer items to Iran via Diamond Technology. The alleged purchaser is Shahid Hemmat Industrial Group (SHIG), which is a branch of the Iranian Ministry of Defence and subject to U.S. sanctions for its involvement in cruise and ballistic missile development. 1998 – 2000: Mazyar Gavidel and his company Homa International Trading Corp. violate the U.S. trade embargo against Iran by illegally transferring approximately $2 million of laundered money through Dubai. Gavidel and Homa International are convicted by the U.S. in August 2002. January 1999: Abu Bakar Siddiqui, a British exporter of Pakistani origin and an alleged procurement agent for A.Q. Khan, allegedly attempts to ship special aluminum sheets to Dubai. May 1999: British customs authorities reportedly seize up to 20 tons of components, including high-grade aluminum, believed to be ultimately destined for Pakistan. The cargo arrived from the U.S. and was allegedly about to be shipped to Dubai. The exporter is allegedly Siddiqui, who is convicted in the United Kingdom in 2001 for illegally exporting strategic materials to Pakistan, including high-strength aluminum bars. 2000: Ras Al Khaimah Free Trade Zone is established near Saqr Port. Companies in the zone are exempt from all domestic ownership and capital requirements, as well as income and corporate taxes. 2001: UAE companies act as intermediaries in the partial delivery of fiber-optic and military communications contracts from South Korea to Iraq, according to the I.S.G. 2001: Dubai’s Ports, Customs & Free Zone Corporation is established to take over customs operations from the Dubai Ports Authority and Jebel Ali Free Zone Authority. 2001: Trade with Iran exchanged through Dubai’s ports was 12 billion dirhams this year, an increase from 4.3 billion in 1997. May 2001 – December 2005: According to the U.S. Department of Commerce, Mine Safety Appliances Company’s Abu Dhabi branch allegedly illegally re-exported U.S. safety and protection-related items from the UAE to Iran and Syria 107 times. June 2001: Bef Corp. allegedly exports photo finishing equipment to SK of Dubai, which transships the equipment to Iran, in violation of U.S. sanctions. September 2001: The UAE’s Advance Technical Systems (ATS) purchases $16,000 of military radar components from the U.S. and transships them to Pakistan after declaring that they were for the Bangladeshi Air Force. Tariq Ahmed, reported owner of ATS, and Yasmin Ahmed, ATS sales representative, plead guilty in June 2003 to conspiring to illegally export parts for howitzers, radars, and armored personnel carriers. September 2001 – March 2003: According to the U.S. Department of Commerce, UAE-based Super Net Computers, L.L.C. orders super servers, motherboards, and computer chassis from the U.S. and forwards them to Iran. October 2001: A UAE-based firm facilitates trade in ballistic missile-related goods from China to Iraq, according to the I.S.G. December 2001 – March 2002: According to the U.S. Department of Commerce, Dubai’s Teepad Electronic General Trading exports controlled telecommunications devices from the U.S. to Iran. February 2002 – November 2008: Mohammad Reza Vaghari and Mir Hossein Ghaemi, Iranians residing in the U.S., export laboratory equipment and fuel cell systems to Iran, via the UAE. April 2002: According to the U.S. Department of Commerce, Tariq Ahmed attempts to illegally export components for an online chemical monitoring system from the U.S. to the Karachi Nuclear Power Plant (KANUPP) in Pakistan, via the UAE. May 2002: The German government warns its exporters that since 1998 Iraq has been increasingly engaging in procurement activities through Dubai. Germany believes that North Korea has also increased its operations in Dubai. August 2002: The U.S. firm Mercator, Inc. agrees to a $30,000 settlement with the U.S. Department of Commerce, which had alleged that Mercator exported chemicals to Dubai with the knowledge that they would be re-exported to Iran without prior authorization. November 2002 – August 2004: According to the U.S. Department of Commerce, U.S.-based State of the Art, Inc. allegedly filed seven Shipper’s Export Declarations (SED) falsely reporting the ultimate destination of fixed resistors as the UAE, when India was the ultimate destination. December 2002: The U.S. Navy accuses Dubai’s Naif Marine Services of smuggling to Iraq polymers that could be used to manufacture explosives. 2003: The UAE joins the IAEA Convention on the Physical Protection of Nuclear Material. 2003 – 2012: Harold Rinko and his company, Global Parts Supply, conspire with British national Ahmad Feras Diri and Syrian citizen Moawea Deri to export laboratory equipment, including items used to detect chemical warfare agents, from the United States to Syria, via Jordan, the United Kingdom, and the UAE. 2003: U.S.-based SparesGlobal, Inc. illegally exports to the UAE restricted graphite products that can be used in nuclear reactors and nose cones of ballistic missiles; the products are then forwarded to Pakistan. January 2003: Spare parts for Mirage F-1 aircraft and Gazelle attack helicopters are transferred to Iraq. U.S. intelligence reportedly believes that parts were purchased from France by Dubai’s Al Tamoor Trading Co., and then smuggled to Iraq through a third country, reportedly Turkey. May 2003 – February 2004: Mohammad Farahbakhsh allegedly exports a U.S. satellite communications system to Iran via UAE-based Diamond Technology LLC without the required license. May 2003 – January 2004: According to the U.S. Department of Justice, John Nakkashian, then vice president at Air Shunt Instruments Inc., allegedly exports military components, including components for the J85 engine used on the F-5 fighter jet, from the U.S. to Dubai without the required licenses. October 2003: Sixty-six triggered spark gaps, which can be used to detonate nuclear weapons, are shipped without the required license from the United States to Top-Cape Technology in South Africa. They are subsequently transshipped via Dubai to AJMC Lithographic Aid Society in Pakistan. In 2004, Asher Karni, an Israeli living in South Africa, pleads guilty to conspiring to export controlled commodities to Pakistan without validated export licenses. In 2005, the U.S. indicts Humayun Khan of the Pakistani company Pakland PME for violating export restrictions and being the ultimate purchaser. October 2003: Five containers of centrifuge components, sent by B.S.A. Tahir and shipped through Dubai, are seized en route to Libya. The items are part of four shipments made by Malaysia’s Scomi Precision Engineering (SCOPE) between 2002 and 2003 to Dubai’s Aryash Trading Company. October 2003: According to B.S.A. Tahir, the BBC China, the ship carrying the seized centrifuge components, was also transporting an aluminum casting and dynamo for Libya’s centrifuge workshop. The consignment was allegedly sent via Dubai by TUT Shipping on behalf of Gunas Jireh of Turkey. October 2003: Two weeks after the seizure of the centrifuge components, B.S.A. Tahir arranges the transshipment to Libya, via Dubai, of an electrical cabinet and power supplier-voltage regulator on behalf of Selim Alguadis, an associate of A.Q. Khan. December 2003: Hamid Fathaloloomy, principal of Dubai’s Akeed Trading Company, allegedly attempts to export U.S. pressure sensors to Iran. 2003 – 2006: According to the U.S. Department of Commerce, Engineering Physics Software Inc. is allegedly involved in sixteen exports of controlled engineering software programs to Iran via the UAE, without the required authorizations. 2004: Over 400 companies are operating in the Ras Al Khaimah Free Trade Zone, 38% of which are Indian. The Dubai Ports Authority’s capacity passes six million TEU. January 2004 – November 2006: According to a U.S. indictment, Ali Akbar Yahya and Farrokh Nia Yaghmaei, managers of Mayrow General Trading, allegedly use the Mayrow, Majidco and Micatic companies to export electronic components that could be used in improvised explosive devices (IEDs) from the U.S. to the UAE, and then forward the components to Iran. January 2004 – May 2008: According to a U.S. indictment, Baktash Fattahi and ten other defendants allegedly export military aircraft parts to Iran, via the UAE. February 2004: According to the U.S. Department of Commerce, Proclad International Pipelines Ltd. allegedly attempts to export nickel alloy pipes from the U.S. to Iran via the UAE without the required authorization. April 2004: Elmstone Service and Trading FZE is sanctioned for two years by the United States for transferring to Iran equipment and/or technology of proliferation significance since 1999. Spring 2004 – Spring 2007: According to a U.S. indictment, Yousef Boushvash allegedly exports U.S. military aviation parts to Dubai without the required licenses. June 2004: According to the U.S. Department of Commerce, Matthew Ayadpoor, based in the U.S., allegedly attempts to illegally export piston-type differential pressure gauges to Iran via the UAE. August 2004: The U.S. indicts Khalid Mahmood, of Dubai, for breaking the U.S. embargo to Iran. Mahmood allegedly attempted to arrange the sale of forklift radiators from the U.S. to Iran by concealing the final destination in the sale. September 2004: The I.S.G. lists twenty UAE firms that are suspected of having acted as intermediaries or front companies for Saddam Hussein’s Iraq, and says that the UAE was a transit location for prohibited goods. September 2004: According to U.S. Immigration and Customs Enforcement, Mohammad Fazeli of Los Angeles allegedly orders 103 pressure sensors and attempts to export them from the U.S. to the UAE without the required authorization. The sensors are intended to be forwarded to Iran. September 2004: German national Helmut R. is arrested for allegedly brokering a contract for the procurement of guided manipulators used to handle spent fuel rods between Societe d’Innovations Techniques, a French company, and Iranian Industrial Development and Renovation Organization. The cargo was intended to be shipped through the UAE. December 2004: The UAE agrees to join the U.S. Container Security Initiative (C.S.I.). U.S. customs officials will be stationed in Dubai to help target and screen suspect cargo bound for the United States. 2005: More than 300 Iranian companies are known to have operated in Dubai’s Jebel Ali Free Zone. 2005: Dubai is the sixth largest port in the world for container traffic. 2005: The UAE joins the UN International Convention for the Suppression of Acts of Nuclear Terrorism. 2005 – 2012: According to the FBI, Borna Faizy and Touraj Ghavidel conspire to export U.S.-origin computers and computer equipment to Iran, falsely listing the UAE as the destination and using a UAE-based freight forwarding company to ship the equipment to Iran. January 2005: According to the U.S. Department of Commerce, U.S.-based Select Engineering, Inc. allegedly sold and/or caused to be transported medical equipment from the U.S. to Iran, via the UAE, without the required authorization. February 2005: The Jebel Ali Free Zone Authority launches an expansion project to develop its manufacturing in industry specific sectors, including medical products, food processing and the chemicals sector. March 2005: Dubai’s participation in the C.S.I. becomes operational. April 2005 – March 2007: According to the U.S. Department of Justice, George Frank Myles, Jr. illicitly supplies military aviation parts to an Iranian national, who picks up some of the parts in Dubai. May 2005: Dubai signs a Memorandum of Understanding with the U.S. to join the Megaports Initiative, which is intended to detect and seize shipments of radioactive material. July 2005: The German government warns its exporters that trading companies in Dubai are being used in proliferation activities, especially with Iran. Fall 2005: According to the U.S. Department of Justice, U.S. resident Mojtada Maleki-Gomi attempted to evade the U.S. embargo against Iran by shipping textile machinery from the U.S. to Iran, via Dubai. October 2005 – October 2007: Robert Kraaipoel and his son, Robert Neils Kraaipoel, both Dutch citizens, use their company, Aviation Services International, to ship U.S.-origin aviation parts to Iran via third countries, including the Netherlands, Cyprus, and the UAE. October 2005 – March 2010: Pakistani national Nadeem Akhtar and his co-conspirators procure and use his company Computer Communication USA to illegally export nuclear-related items to Pakistan via the UAE. Among the end-users are the Pakistan Atomic Energy Commission, Chashma Nuclear Power Plant, and Space and Upper Atmosphere Research Commission. 2006 – The UAE joins the Proliferation Security Initiative (PSI). August 2006 – February 2007: According to a U.S. indictment, Ireland-based Mac Aviation allegedly arranges the export of U.S.-origin aircraft parts to Dubai with invoices indicating that their final destination is Iran. October 2006 – June 2007: Naturalized U.S. citizens Hassan Saied Keshari and Traian Bujduveanu allegedly procure U.S.-made military aircraft parts and cause them to be exported to Dubai and then forwarded to Iran. October 2006 – June 2008: Mark Mason Alexander, also known as Musa Mahmood Ahmed, conspires with two Iranian businessmen to ship water-jet cutting systems to customers in Iran, transshipping them via his UAE-based company, Hydrajet Mena, to conceal the true end-user. May 2007: Reza Tabib is sentenced by the U.S. government for illegally exporting U.S. military aircraft parts to Iran via associates in Germany and the UAE. August 2007: The UAE enacts a law for the control of exports and re-exports of strategic goods, including military equipment, chemical and biological materials, and dual-use items. The law also establishes a National Commission for oversight. October 2007 – June 2011: According to the FBI, Susan Yip, a citizen of Taiwan, Mehrdad Foomanie, of Iran, and Merdad Ansari, of the UAE, operate a scheme to procure over 105,000 parts and transship them to Iran through Ansari’s Dubai-based company. December 2007 – November 2008: Jirair Avanessian conducts at least seven shipments of vacuum pump equipment, which can be used to enrich uranium, to Iran via a free trade zone in the UAE. 2008 – 2012: Iranian company Business Machinery World Wide exports U.S.-origin computer equipment to Iran, transshipping the items through its Dubai-based subsidiaries, Servex DWC LLC and Ariana General Trading. March – April 2008: Murat Taskiran, a Turkish citizen, and Hamid Reza Hashemi, a dual U.S.-Iranian citizen, illegally export carbon fiber from the United States to Iran, via Europe and Dubai. March 2008: UAE authorities reportedly disrupt the import and re-export of 240 kg of zirconium. May 2008: Afshin Rezaei is sentenced by the U.S. government for the unlicensed export of computers from the U.S. to Iran, via the UAE. August 2008: UAE authorities impound a Malaysian shipment of specialized aluminum tubes that can be used for aeronautical and military purposes. UAE authorities also seize a Chinese shipment of titanium sheets bound for Iran. September 2008: Based on U.S. intelligence, UAE authorities impound a Chinese shipment of specialized aluminum sheets that can be used for ballistic missiles. November 2008 – January 2010: Michael Todd, Syed Amir Ahmed Najfi, and others export military aircraft parts from the United States to Iran. Dubai-based Aletra General Trading is involved in the conspiracy. 2009 – September 2012: Randy Dale Barber, John Alexander Talley, and Talley’s company Talleyho Peripherals export sophisticated computer equipment from the United States to Iran via the UAE. According to the U.S. Department of Justice, Iranian nationals Mahmood Akbari and Reza Hajigholamali and three UAE-based front companies, Patco Group Ltd, Managed Systems and Services (FZC), and TGO General Trading LLC are also part of the conspiracy. 2009 – 2015: Ali Reza Parsa, a Canadian-Iranian national, procures high-tech dual-use equipment, some used in the production of missiles, from U.S. companies on behalf of Iranian clients, and has them shipped to Iran via Canada and the UAE. January 2009: Hassan Keshari pleads guilty to charges of conspiracy to export military and commercial aircraft components to Iran, via Dubai. February 2009: The UAE Committee on Commodities Subject to Import and Export Control is reportedly created to strengthen and develop implementation of the UAE’s Federal Export Control Law. The Committee holds its first meeting in May. February 2009 – August 2009: Belgian national Jacques Monsieur conspires with Iranian national Dara Fatouhi to export engines for F-5 fighter jets and C-130 transport aircraft to Iran, via Colombia and the UAE. March 2009: The International Atomic Energy Agency (IAEA) reportedly approves the UAE’s ratification of the Additional Protocol, allowing additional nuclear inspection measures in the country. April 2009: Canadian authorities charge Toronto resident Mahmoud Yadegari with attempting to ship ten U.S. pressure transducers, which can be used for uranium enrichment, from the U.S. to Iran, via Dubai. April 2009: Baktash Fattahi, an Iranian national and legal U.S. resident is arrested in California. He and 10 other defendants are indicted in Florida for exporting U.S.-origin parts for fighter jets and military helicopters to Iran, via Dubai. Fattahi later pleads guilty and is sentenced to 35 months in prison. June 2009: UAE-based Elia General Trading attempts to provide German-made specialty alloys to Iran’s Kian Metals Company. July 2009: UAE authorities seize a North Korean military shipment bound for Iran aboard the ANL Australia. The shipper is the Pyongyang office of OTIM SPA, an Italian company. August – September 2009: Andre Telemi and Davoud Baniameri attempt to export U.S.-origin missile components to Iran, via the UAE. September 2009: Netherlands based Aviation Services International (ASI), its owner Robert Kraaipoel, and his son Robert Neils Kraaipoel, plead guilty to ordering aircraft components on behalf of Iranian companies and transshipping them via the Netherlands, Cyprus, and the UAE. November 2009: Belgian national Jacques Monsieur pleads guilty to conspiring to export F-5 fighter jet engines from the United States to Iran via the UAE and Colombia. November 2009 – 2013: Ali Saboonchi, a U.S. citizen, and Arash Rashti Mohammad, an Iranian national, conspire with others to export U.S.-origin industrial goods and services to Iran through entities in China and the UAE. February 2010 – September 2011: Omidreza Khademi, an Iranian national and a resident of the UAE, conspires on at least four occasions to ship computer-related items to Iran, using Omid General Trading, his Dubai-based company. July 2010: Jirair Avanessian pleads guilty to conspiring to ship vacuum pumps and related equipment, including items with applications in uranium enrichment, to Iran through a free trade zone in the UAE, falsely listing the UAE as the final destination of the goods. December 2010 – February 2011: UAE freight forwarding company Aramex Emirates facilitates the re-export of U.S.-origin network devices and software to Syria. Early 2011: Iranian government-controlled Execution of Imam Khomeini’s Order transfers money to one of its German affiliates through Dubai-based Golden Resources Trading Company L.L.C. January 2011: Mehrdad Yasrebi and his Oregon-based charity, Child Foundation, plead guilty to transferring money disguised as embargo-exempt food commodity transaction funds to Iran, via Dubai. February 2011: Mohammad Reza Vaghari is convicted by the U.S. government of delivering laboratory equipment, including centrifuges, to Iran, via the UAE, using his Pennsylvania-based Saamen Company. His co-conspirator, Mir Hossein Ghaemi, pleads guilty in November 2012. May 2011: Davoud Baniameri pleads guilty to conspiring to export radio test sets and TOW missile components to Iran, via Dubai. June 2011: UAE-based Aletra General Trading, doing business as Erman & Sultan Trading Company, is indicted by the U.S. government for involvement in shipping restricted components for fighter aircraft and attack helicopters to Iran. The conspiracy allegedly involved seven individuals and five companies based in the U.S., France, and the UAE. September 2011: Pakistani national Nadeem Akhtar pleads guilty to charges relating to illegally exporting nuclear-related items to Pakistan through the UAE. July 2012: Susan Yip of Taiwan pleads guilty to charges of conspiracy related to transshipping dual-use items from the United States to Iran, via Dubai. July 2012: Andro Telemi, a naturalized U.S. citizen from Iran, pleads guilty in Illinois to attempting to export TOW and TOW 2 missile components to Iran, via Dubai. Co-conspirators include Davoud Baniameri and Syed Majid Mousavi. December 2012 – June 2013: Arash Ghahreman, a naturalized U.S. citizen from Iran, attempts to acquire and export fiber optic gyrocompasses, electron tubes, and other sensitive technologies from the United States to Iran, using a front company and banks in the UAE for transshipment and money laundering. January 2013: The Spanish National Police arrest two individuals suspected of attempting to ship valves suitable in nuclear programs, including Inconel 625 valves, to Iran, via the UAE, using the company Fluval Spain S.L. May 2013: The U.S. Department of the Treasury designates UAE-based Al Hilal Exchange and Al Fida International General Trading for providing services to Iran’s Bank Mellat. Additionally, the Central Bank of the UAE revokes Al Hilal’s license for anti-money laundering violations. May 2013: The U.S. Department of the Treasury designates DFS Worldwide, which has offices in multiple countries, including the UAE, for shipping goods from Dubai to Tehran on behalf of the Islamic Revolutionary Guard Corps Qods Force (IRGC-QF). May 2013: Seyed Amin Ghorashi Sarvestani, an Iranian national, pleads guilty in New York to charges of using his UAE-based companies to transship satellite technology from the United States to Iran. May 2013: Omidreza Khademi, an Iranian national living in the UAE, pleads guilty in the District of Columbia to the unlicensed export of laptops and an underwater acoustic transducer from the United States to Iran, via his UAE-based company Omid General Trading Company LLC. July 2013: Hamid Reza Hashemi, an Iranian national, pleads guilty in New York to conspiring to export carbon fiber from the United States to Iran, via Europe and the UAE. August 2013: Iranian company Business Machinery World Wide and its two Dubai-based subsidiaries, Servex DWC LLC, and Ariana General Trading, plead guilty to charges related to exporting more than $30 million in computer components to Iran, via Dubai. September 2013: John Alexander Talley and his company Tallyho Peripherals plead guilty to conspiring to export sophisticated computer equipment from the United States to Iran, via the UAE. September 2013: Iranian nationals Mahmood Akbari and Reza Hajigholamali, as well as UAE companies Patco Group Ltd, Managed Systems and Services FZC, and TGO General Trading LLC, are indicted by the U.S. Department of Justice in connection with a conspiracy to export IT equipment and services to Iran via the UAE. September 2013: Mark Mason Alexander, is found guilty on charges related to selling and shipping water-jet cutting systems to clients in Iran and the Middle East, using his UAE-based company, Hydra Mena, to transship the items. February 2014: Randy Dale Barber pleads guilty to conspiracy charges related to the export of computers to Iran, via the UAE. August 2014: Ali Saboonchi is convicted by a U.S. federal jury for his involvement in exporting industrial goods to Iran, using companies in China and the UAE. September 2014: Borna Faizy and Touraj Ghavidel plead guilty to charges related to illegally shipping $12 million worth of computer equipment to Iran, using freight-forwarding companies in Dubai. September 2014: Harold Rinko, owner of Global Parts Supply, pleads guilty in Pennsylvania to transshipping laboratory equipment, including items for the detection of chemical warfare agents, to Syria, via Jordan, the U.K., and the UAE. December 2014: The U.S. Department of the Treasury announces that the Iranian government has obtained hundreds of millions of dollars in cash that was reportedly carried on flights from Dubai or Turkey after passing through front companies in Iraq or the UAE. 2015: Hossein Pournaghshband and his UAE-based company, Mabrooka Trading, procure material and equipment, including items related to the production of carbon fiber, on behalf of Iran’s Navid Composite Material Company. April 2015: Arash Ghareman is convicted by a U.S. grand jury for his role in an Iranian procurement network that used a front company and banks in Dubai to transfer gyrocompasses for use in marine navigation devices from the United States to Iran, via the UAE. January 2016: Ali Reza Parsa, a Canadian-Iranian dual citizen, pleads guilty in New York to procuring and exporting sensitive electronic components from the United States to Iran, via Canada and the UAE. March 2016: A network of individuals and companies overseen by Frank Genin is added to the U.S. Department of Commerce’s Entity List for supplying U.S.-origin items to an entity associated with the Iranian defense industry. Many of the companies and individuals are located in the UAE. May 2016: Ahmad Feras Diri pleads guilty to charges related to the illegal export of laboratory equipment, including items used to detect chemical warfare agents, to Syria, via Jordan, the U.K., and the UAE. February 2017: UAE-based Royal Pearl General Trading is identified by the U.S. Treasury Department as a front company being used to procure items for Shahid Bagheri Industrial Group (SBIG) and Aerospace Industries Organization (AIO) in support of Iran’s ballistic missile program. Company CEO Kambiz Rostamiam is also identified for his role in the procurement efforts. What is the Jebel Ali Free Zone?